What is an aneurysm and an abdominal aortic aneurysm? An aneurysm is where a section of an artery widens (balloons out). The wall of an aneurysm is weaker than a normal artery wall. The pressure of the blood inside the artery causes the weaker section of wall to balloon. Aneurysms can occur in any artery, but they most commonly occur in the aorta. Most aortic aneurysms occur in the section of the aorta that passes through the abdomen. These are known as abdominal aortic aneurysms. Sometimes they occur in the section going through the chest. These are known as thoracic aortic aneurysms. An abdominal aortic aneurysm usually causes no symptoms unless it ruptures (bursts). A ruptured abdominal aortic aneurysm is often fatal. An abdominal aortic aneurysm less than 55 mm wide has a low chance of rupture. An operation to repair the aneurysm may be advised if it is larger than 55 mm, as above this size the risk of rupture increases significantly. Men aged 65 and over are to be offered a routine scan to screen for abdominal aortic aneurysm. Depending on the size and rate at which your abdominal aortic aneurysm is growing, treatment may vary from watchful waiting to emergency surgery. Once an abdominal aortic aneurysm is found, doctors will closely monitor it so that surgery can be planned if it's necessary. Emergency surgery for a ruptured abdominal aortic aneurysm can be risky. Aneurysms can develop anywhere along the aorta, but when they occur in the upper part of the aorta, they are called thoracic aortic aneurysms. 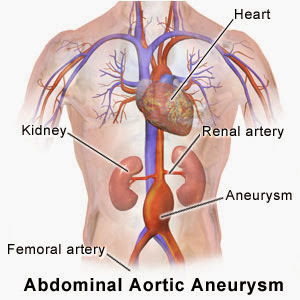 More commonly, aneurysms form in the lower part of your aorta and are called abdominal aortic aneurysms. An abdominal aortic aneurysm can develop in anyone, but is most often seen in males over age 60 who have one or more risk factors. The larger the aneurysm, the more likely it is to rupture and break open. About 4 in 100 men and about 1 in 100 women over the age of 65 have an abdominal aortic aneurysm. It becomes more common with increasing age. However, most people with an abdominal aortic aneurysm are not aware that they have one (see below in the section on symptoms). An abdominal aortic aneurysm is rare in people under the age of 60. What is the concern about an abdominal aortic aneurysm? The main concern is that the aneurysm might rupture (burst). The wall of the aneurysm is weaker than a normal artery wall and may not be able to withstand the pressure of blood inside. If it ruptures then severe internal bleeding occurs which is often fatal. Most abdominal aortic aneurysms do not rupture - only a certain proportion. Aneurysms develop slowly over many years and often have no symptoms. If an aneurysm expands quickly, tears open (ruptures), or blood leaks along the wall of the vessel (aortic dissection), symptoms may develop suddenly. You should see your doctor if you have any of the symptoms listed above. Anyone age 60 and older who has risk factors for developing an abdominal aortic aneurysm, such as smoking or a family history of abdominal aortic aneurysm, should consider regular screening for the condition. Because being male and smoking significantly increase the risk of abdominal aortic aneurysm, men ages 65 to 75 who have ever smoked cigarettes should have a one-time screening for abdominal aortic aneurysm using abdominal ultrasound. If you have a family history of abdominal aortic aneurysm, your doctor may recommend an ultrasound exam to screen for the condition. There are no specific screening recommendations for women. Ask your doctor if you need to have an ultrasound screening based on your risk factors. Sometimes a doctor feels the bulge of an aneurysm during a routine examination of the abdomen. However, many abdominal aortic aneurysms are too small to feel. An X-ray of the abdomen (often done for other reasons) will show calcium deposits lining the wall of an abdominal aortic aneurysm in some, but not all, cases. An ultrasound scan is the easiest way to detect an abdominal aortic aneurysm. This is a painless test. It is the same type of scan that pregnant women have to look at the baby in the womb. The size of the aneurysm can also be measured by ultrasound. As discussed later, it is important to know the size. A more detailed scan, such as a CT scan, is sometimes done. This may be done if your doctor needs to know whether the aneurysm is affecting any of the arteries that come off the aorta. For instance, if the aneurysm involves the section of the aorta where the arteries to the kidneys branch off, surgeons need to know this information if they plan to operate. If you have bleeding inside your body from an aortic aneurysm, you will have open abdominal aortic aneurysm repair. Surgery is rarely done if the aneurysm is small. You and your doctor must decide whether the risk of having surgery is smaller than the risk of bleeding if you do not have surgery. Your doctor may recommend checking the size of the aneurysm with ultrasound tests every 6 months to see if it is getting bigger. Surgery is usually recommended for patients who have aneurysms bigger than 2 inches (5.5 cm) across and aneurysms that are growing quickly. The goal is to perform surgery before complications or symptoms develop. The most commonly used surgical treatment for an abdominal aortic aneurysm is grafting. This involves removing the affected section of the aorta and replacing it with a piece of synthetic tubing known as a graft. Endovascular surgery (or stenting) is a less invasive procedure than conventional aneurysm surgery, which is done through a long cut in the abdomen. Both types of surgery have equal success in preventing death from a ruptured aneurysm (or other complications). However, endovascular surgery is associated with a higher chance of surviving the treatment. For example, research has found that around 1 in 20 people died in the first 30 days after open surgery compared to 1 in 50 people who had endovascular surgery. This is because endovascular surgery doesn't involve making a large cut into your abdomen, so it has a much quicker recovery time than open surgery. However, endovascular surgery has its own disadvantages; the stents may shift or kink, or they may leak into the aneurysm (endoleak), which may need further surgery or stenting. For this reason, everyone with a stent will require a long-term surveillance programme after treatment. Your surgical team will be able to make recommendations about whether to have open or endovascular repair for your aneurysm, but the ultimate decision is yours. Not everyone is suitable for endovascular surgery. In some cases, the characteristics of the aneurysm mean that only open surgery can be used. For example, you may have unusually narrow blood vessels or an aneurysm in a position that makes endovascular surgery too difficult. A CT scan is needed to help make the decision about which treatment is suitable. You should be given regular check-ups so that your aneurysm can be carefully monitored. This usually involves having an ultrasound scan every three months, or annually. Lifestyle changes to lower your risk of a rupture will usually be recommended. If you smoke, the most important change you can make is to stop smoking. People who smoke usually have faster-growing aneurysms than non-smokers. The larger the aneurysm, the higher the risk of it rupturing. If you have another health condition that's thought to be related to your aneurysm, such as high blood pressure, you may be given medication to treat that condition. If you have some risk factors for aortic aneurysm, talk to your doctor. If you are at risk, your doctor may recommend additional measures, including medications to lower your blood pressure and relieve stress on weakened arteries. One of the leading causes of atherosclerosis is eating a diet that's high in fat. Low-density lipoprotein (LDL) – this is mostly made up of fat, plus a small amount of protein. This type of cholesterol can block your arteries, so it's often referred to as bad cholesterol. High-density lipoprotein (HDL) – this is mostly made up of protein, plus a small amount of fat. This type of cholesterol can reduce any blockage in your arteries, so it's often referred to as good cholesterol. There are also two types of fat: saturated and unsaturated. Avoid food containing saturated fats because these will increase the levels of bad cholesterol in your blood. However, eating a small amount of unsaturated fat will increase the level of good cholesterol and reduce any blockage.